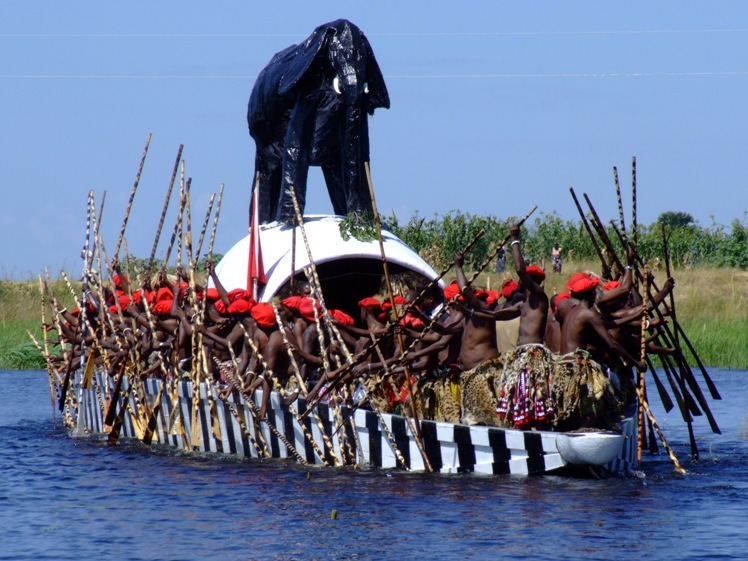 T he Kuomboka Ceremony is carried out in the town of Mongu by the Lozi people of Zambia. “Kuomboka” means “coming out of the water.” It is the actual and ceremonial movement of the Lozi people and their chief, the Litunga, from the flood plains to higher ground. Every year, the Barotse plains of the upper Zambezi flood during the rainy season. The Litunga is transported from his palace at Lealui to higher ground at Limulunga. He is transported in his boat called the Nalikwanda. The Nalikwanda is distinct with its black and white stripes with a wooden elephant on top of it. His 100 rowers are outfitted with leopard skins, lion’s manes and red hats. The Litunga’s wife travels in a second boat. Her boat has a wooden cattle egret on it. Both the wings of the cattle egret and the ears of the elephant can be moved from inside the boats. The Lozi settled on the flood plain because it is much more fertile than the surrounding areas. The fertile black soil is replenished yearly when the Zambezi river overflows its banks. Once the plain floods, the people move to higher ground to avoid drowning, animals and insects. They move with their possessions and livestock. Once they arrive at Limulunga, the Litunga addresses everyone. Then there is singing, dancing and much celebration. Around August, the waters recede from the Barotse Plain. The Litunga and his people return to Lealui. The return ceremony is called Kufuluhela. While less well-known, Kufulehela is just as important as Kuomboka. The Kuomboka ceremony has been practised for about 300 years. It falls between late March and early April. The date is announced every year and must fall on a full moon after the floods have begun. Kuomboka is a great opportunity to experience Zambian culture.